Well if you got that lean. J.W. 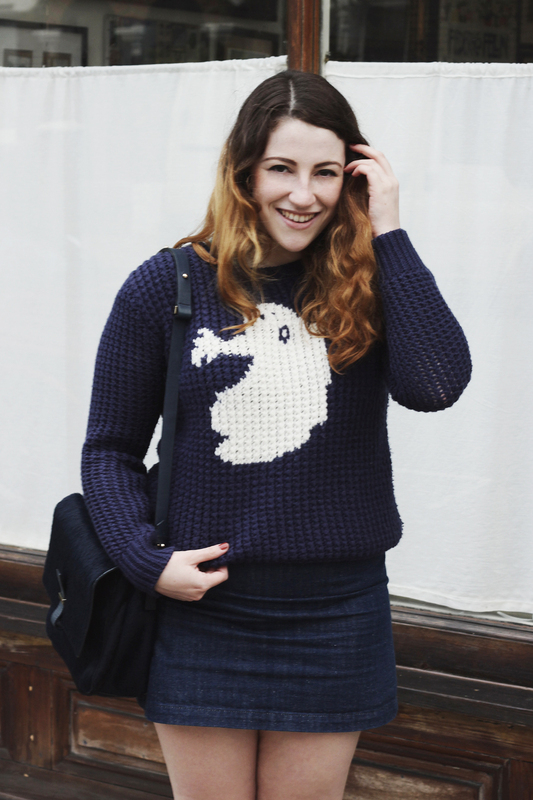 Anderson x Topshop ghost jumper: £56 (similar). Warehouse denim skirt: £2, via sample sale. Bally chelsea boots: £8, via charity shop. Topshop lace frill socks: gift. Whistles ponyskin bag: borrowed from Charlotte. If ever there were a time to stray from my usual Sunday routine of sitting in bed with a cup of tea putting the final touches to a blog post, it would be Halloween. Up until the last couple of years this holiday passed me by in an orange-hued blur, but more recently I've found myself more inclined to celebrate and raid the fancy dress shops for something to top last year's attempts (which, in case you were wondering, were a drunken sunken sailor and my lookalike). I'm not quite ready to reveal what this year's costume will be, but keep your eyes on instagram and twitter this evening as I'm sure there'll be time for a quick ootn! Of course, I'm not going to let the daytime escape a little Halloween nod, so I'll be sure to slip into my trusty J.W.Anderson x Topshop ghost jumper and risk the tuts and glares of many an exasperated City worker on my commute. Whether you're heading out to terrify the neighbourhood or treating yourself to a night in, I hope you have a lovely Halloween! The jumper couldn't be anymore perfect! I love the jumper, I have the New Look xopy from last year but forgot to wear it! Who would tut at that?! It was her heart that he was stealing. So I call your name, the only thing I know. My girl's got a city to run.